Free Uncle Ben’s Flavor Infusions Rice (12.9 oz., any variety) in Kroger stores, with coupon. This Kroger Free Friday Coupon is available for download on Friday, November 3, 2017 but you have until November 19, 2017 to redeem it. What is Uncle Ben’s Flavor Infusions Rice? An easy and delicious way to add flare to your next meal. This delicious product cooks in just 10 minutes, and no addition of butter is required. No artificial preservatives or colors. For firmer rice, use less water and reduce cooking time, while for softer rice use more water and increase cooking time. Ingredients: Long Grain Parboiled Rice; Seasoning Blend [Hydrolyzed Soy Protein and Wheat Gluten, Salt, Garlic Powder, Natural Flavors (includes Milk) Maltodextrin, Autolyzed Yeast Extract, Onion Powder, Gum Arabic, Mustard, Tumeric (Color)]; Iron Phosphate; Niacinamide; Thiamin Mononitrate; Folic Acid. 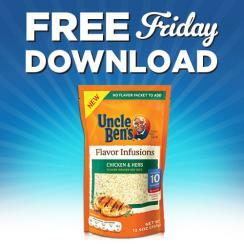 Redeem your coupon in-store within 2 weeks for One Free Uncle Ben’s Flavor Infusions Rice (12.9 oz., any variety). Your coupon will automatically be applied at checkout when you use your Shopper’s Card. Available in most stores.